Sikre en stressfri start på ferien med denne delte transfertjenesten fra Los Angeles International Airport (LAX) til San Pedro cruiseterminal eller Long Beach havn. Det er et enkelt, kostnadseffektivt alternativ som er tilgjengelig 24 timer i døgnet. Transport er med komfortabel buss. Å komme fra LAX til cruiseterminalen din kan være komplisert, men det trenger ikke å være. Dette praktiske alternativet tar alt stresset med å leie bil eller betale for en taxi etter et fly. Bare skriv inn dine detaljer når du bestiller, og din delte overføring er bekreftet umiddelbart. Når du lander, vis kupongen din til føreren og hopp inn i bilen. Tjenesten er tilgjengelig 24 timer i døgnet, så det spiller ingen rolle når flyet ditt kommer. Vær oppmerksom på: Det er maksimalt bagasjeavgift på to kofferter og en bærepose per person. Good service, just make sure you have plenty of time since they can take a long time to pick you up. Good choice to go from one point to another. Well on time and smiling personnel. Would recommand it without any hesitation. The instructions on where to find the contact for the transfer were totally misleading....it took me over ten minutes to finally locate them. The instructions failed to say that you had to go to the beginning of the terminal building to locate the vehicles. Instead the instructions said they would be right outside the baggage pickup. Otherwise, transfer was fine once underway. It took us a little bit of time to figure out that we were not looking for Viator but Supershuttle but everything went smoothly after that. The trip was easy. 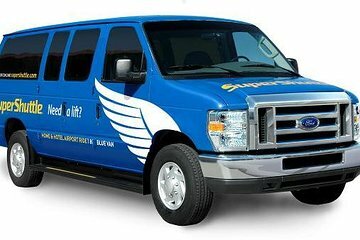 Easy to find the Shuttle Express coordinator on the curb outside of baggage claim. We waited about 15 or 20minutes for the van to Long Beach Cruise ship port, but the price was about half of a taxi or other transportation. The driver was safe and courteous and dropped us off right at the cruise ship check in. Very good value. Interesting trip through lots of neighborhoods, as we dropped off people at their homes along with those going to the cruise ship terminals. Allow lots of time...we were on the road a couple of hours. I would book it again...inexpensive for sure! Since we already had a reservation, we expected for the van to be waiting for us. We had to wait for half and hour. In that case there's no point to book your ride in advance, you can just go the curb and ask for the service right there. The driver was using his cellphone while taking us to the port. Princess Cruises gives you good value for the money. Mexico and Central America have beautiful ports with great sights, history and beaches. I especially like the nightly entertainment on board, very high quality performances.